On Monday we had our 2nd weekly meeting in the office and amongst other thing we discussed the upcoming on-arrival-training that will take place in Pamplona and – travelling included - it will last for 6 days . Trainings are part of EVS (SVE) and other than this one, there also will be a mid-term training too in a couple of months. After the meeting ended Maria Antonia explained us what she is doing on the behalf of Acción Balear. She is organizing international volunteering (IV) opportunities and work camps (the good kind) in Morocco that take place during summers. If you want to know more about these projects than take a look at the website. Me and Pier also learned about the future plans for IV and ways to help Maria Antonia with the promotion of these opportunities. Next day in the afternoon we visited Banys Arabs (Arab Baths). It's a tiny place close to the Catedral with a lovely little garden. It costs 2.5€ and it doesn't take longer than 15-20 minutes to explore it. In my opinion it's worth to check it out, but it probably shouldn't be your first or even second destination when you visit Palma. Later that day we went to watch a movie in Parc de la Mar (in front of the Catedral). From the middle of July until September 10th there are plenty of nights when you can do the same. It's called Cinema a la Fresca and it's completely free. But you need there like an hour before the movie starts to get the best seats. And don't forget to bring some some snack & drinks. Here you can find a list of the movies. The day after we went to a nearby bakery, because on Wednesdays it is Ruta del Llonguet– from July 20th until October 26th – in 49 bakeries/ pastry shops you can get a drink and a sandwich for 2.5€. Expect something like this. On that day we visited SPAP Mallorca, an animal rescue centre, daycare and shelter for dogs & cats. And although in an ideal world animal shelters wouldn't even exist it was nice to see all these animals and meet the people – volunteers too – who take care of them really well. On Thursday we went to check out Espais Joves, a youth organization who offers all types of activities for the local youngsters. They can play board games, video games, browse the internet, record song tracks, dance, practice yoga, cook, bake, etc. I'm looking forward to participate in one of their future activity. The yoga lesson on a surfboard seems quite interesting for example. We also had a meeting with another organization called Amadip. They are working to get a quality life and equal opportunities for people with intellectual disabilities and their families. For example they cooperate with restaurants to be able to offer job opportunities for the people they are working with. In the afternoon we went to Can Pere Antoni, the closest beach for the second time. It's an okay playa, but it's definitely not in the great category (like Playa Illetas for example). On Friday we went to SPAP and went to a walk with 6 dogs. 3 separate walks, 1 dog for each of us every time. It was good fun and a pretty good exercise at the same time, because some of the dogs were not only big, but they were excited as well. We started Saturday with a tour to Bellver Castle (Castell del Bellver). Climbing up to the castle is obviously not as difficult as getting to the top of the Everest, but the heat made it quite challenging. The castle is one of the most iconic sights of Palma, it's a must-see. A little history and amazing view from the top of the castle. After getting back from our tour we spent the rest of the day in the apartment until around noon we went out to check out the nightlife of the city. We found a good little bar and after a beer we got some mojitos and thanks to Pier we ended up playing “Never have I ever...” (“Yo nunca...”) with four girls from Mallorca. I guess it's hardly surprising that Sunday was all about relaxing. The only noteworthy event of the day was at the evening, when we ended the week watching another movie of Cinema a la Fresca. I can confirm that Guardians of the Galaxy is still entertaining if you watch it in Spanish with English subtitles. Next week's post will be mostly about the training in Pamplona and the transformation of the apartment we live in. Should be an eventful one, that's for sure. But for now, thanks for reading! OR maybe keep reading, because the post up until now was written last week, but now I have another few days to write about. And all I can say is that a lot happened during those days. So, let's get into it. Wednesday was an important day for me and Pier, because it was the day when our temporary flat mates, Susana and her 2 daughters were moving out. As the apartment was getting more and more empty we started to paint the walls with Xavi & Pier. After we finished and the movers left with all the stuff we said goodbye to Xavi and we were almost immediately joined by Pier's Italian friends, who came to Palma for a week or so. We went to the beautiful Illetas beach for the second time and later they invited us for dinner where they cooked spaghetti carbonara. But the evening was not over with that, because after all that we headed to the city and had some beers on the square. I was quickly in the company of 11 Italians and I had a great time with them. We got back to the apartment around 2 am, which normally wouldn't have been been a problem. BUT, what I didn't mention before is that we had to leave Palma very early that day. The taxi were waiting for us at 4:45 and I slept like 30 minutes before starting our journey to Barcelona/Pamplona. We took a flight to get to Barcelona. We spent about 3 or 4 hours in the city, we checked out La Sagrada Familia and La Rambla during our short stay. I know that some people like the story of the slow building process of the Sagrada Familia, but to be perfectly honest it kinda spoiled the experience for me. It will be a beautiful thing when it's done, but the presence of the cranes and safety nets is not a great look. The first thing I was thinking about was that I would not stay in the world's best, most beautiful hotel even for free, if it's still under construction. But as I said, when it's finished, it will look brilliant as a whole. We left Barcelona by train and after 4 hours - that felt like forever - we arrived to Pamplona. We met the group and I could barely believe that there were other 3 Hungarians. Later I found out from one of the trainers, Ruth that usually only big nations – like Germany or France - , where EVS is more popular are represented by 4 people on a training. So it was an unexpected surprise. In the group we were mostly speaking English to not to exclude anybody, but when we were alone we spoke in Hungarian and it was refreshing, because since I'm here I only use my language when I call or message my family and Hungarian friends. After arriving to the youth hostel in Alsasua - where we were living during the training - we had the rest of the day full of activities and towards the end of it I was barely able to stay awake due to my short sleep the night before. After we finally could go back to our rooms, me and my new roommate, Danni from Denmark were not exactly optimistic about the week ahead of us. It was probably because some of the activities seemed a little childish and pointless. And we were also very tired. Thankfully things got a lot better by the second day and after that it was a great rest of the week. We had activities in and around the hostel including games, discussions about the duties and rights of EVS volunteers, group exercises to get to know each other and daily Spanish lessons. We learned about insurance, conflict solving, Youthpass, personal projects, etc. A memorable day was our third day in Navarra, when we went for a trip in Pamplona. Sightseeing in a beautiful city, a great dinner with tons of food, funny Germans, a former Hungarian EVS volunteer and a great night in one of the bars of Alsasua, where we were regulars during the nights of our training. It was a small place, but it was alright to have some fun after all the daylight activities. My favorite group activity was easily the intercultural evening, where every volunteer had around 3 minutes to show something interesting about her/his country. Volunteers from the same nations worked in a group. After some brainstorming we (Hungary) decided that we would make a presentation of an Eastern Monday tradition called Water Throwing / Water Pouring. 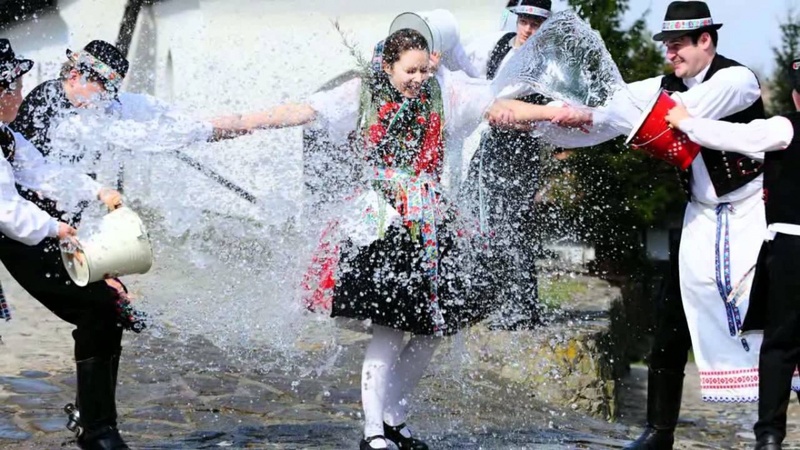 On this day men go to visit female family members and friends to pour water on them with buckets, water sprays, or cologne in exchange of painted eggs and some alcoholic drink like pálinka. It would take a while to explain the reason behind this tradition, so google it, if you want to know more about it. Also, here is a picture of what it looks like when you do it properly, the old-school way. Shortly after we decided to go with this idea, we learned from Lucia, a fellow EVS volunteer from Slovakia that a very similar tradition takes place on Eastern Mondays. The main differences seemed to be the type of the drink (tatratea) and the “whipping” of women during water pouring. Don't worry it's not as bad as it sounds, although some women (in both countries) don't like this tradition, that's for sure. But let me get back to the story: After realizing how similar these traditions were in Slovakia and Hungary, we teamed up with Lucia and the 5 of us presented how the lighter versions of these folk customs look like in reality. This day also ended with some celebration within the hostel and later in the bar. Obviously. Our last full day in Alsasua was on Monday and it ended with big fiesta, a long and really good one. :) But this time the bar was only for us and unlike on previous days almost everybody was there from the group. And it was fun, a lot of it. The night made it completely worth it to almost miss the bus that I had to get on to leave Alsasua in the morning. But Tuesday as a whole just sucked. It was only 6 days since I met the people in the group, but it was awful to say goodbye to them. Even though I appreciate every minute we spent together and I will remember this week forever, but the thought of not seeing these new friends regularly is just awful. Thankfully we are already planning to meet up. I can only hope it will happen soon. The travel back to Palma was similarly long to the one we had a few days ago to get to Pamplona and our flight was delayed which meant that we only arrived back to our apartment around 1am, but that was just the second worst thing of that day behind saying goodbye. I think what makes it difficult for me to handle this situation is the uncertainty. When you leave your family and old friends behind you know they will be there, when you go back months later, but when you make new friendships with people and you have to leave them after only one week then there is no guarantee at all. And as much as I want to be optimistic, the little “what if...?” still stays in the back of my head. And that's really all for this week's post. See you next week!